Halloween can be a stressful holiday for dogs, but following some good guidelines can set you and your dog up for a fun-filled time. Howl-o-ween is just a few days away! As you gear up for all the festivities, don't forget to have a plan in place to make sure your pets stay safe. Read on for expert trainer Kat Stevens-Stanley's insights for the holiday. With friends and neighbors decorating the outsides of their homes, some Halloween haunts can be conflicting for dogs. Whether you walk your dog during the day or evening, spooky monsters and large decorative air inflatables can be unusual sights. If your dog isn’t used to seeing a large inflatable black cat or scarecrow on your front lawn, he may be suspicious. Remember, spooks and scares can be great fun for humans, but can be downright frightening for dogs. So when walking past a Halloween display that your dog seems fearful of, cross the street or put as much space between you and the scary item to make your walk more successful. Dressing up in costumes is the heart of Halloween. 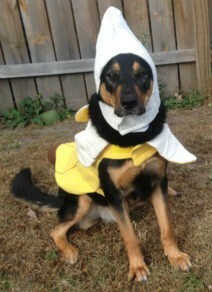 If you’d like to dress your dog in a costume, be sure to choose something that doesn’t restrict your dog’s body type. While dressing up your pooch may be fun for you, be sure to keep an eye out for your animal's signs of stress, including yawning, lip licking, pawing at the costume in attempts to get it off, whining, and pacing. I think a dressed up dog can make for a great memorable photo opportunity, but many dogs do not enjoy a full evening of costume wearing. Consider dressing up your dog for a quick photo session or just before entering a pet costume contest, and then removing the costume for the rest of the night. Adults and children dressed in costume can be conflicting for dogs. While typically more predictable to be around in the eyes of Fido, adults may appear unusual and scary in costumes. If you are wearing a lot of face makeup or a mask, your dog may not recognize you and become stressed. Even on a normal day, children can be uncomfortable for dogs to be around. Their behavior is not as predictable as that of adults, so many dogs are more cautious when children are present in normal circumstances (this is more so if the children are not familiar to the dog). Children are already equipped with a set of movements that differ from adults (imagine how many five-year-olds you know who do well at sitting quietly). A young child dressed in costume tends to bring out the greatest of imaginative behavior. This is a wonderful part of childhood that can be a lot of great fun however, candy plus costume wearing can equal lots of running, laughing, bouncing, and maybe even yelling and screaming if your little one is aiming for a truly spooky scare. Remember, scaring the dog isn’t a nice thing to practice. If your dog is showing signs of stress, give him a place to chill out away from all the action. As much as many of us like to have our dogs with us everywhere, I think the majority of dogs do not enjoy trick-or-treating. If you are thinking about bringing a dog with you trick-or-treating, depending on the age of your children, it would be good to have an extra set of adult hands for managing the dog, so another adult can accompany a child to a door. Keep in mind other unfamiliar kids, especially those in costume, can be a lot for a dog to stay calm and comfortable around, so if your dog does not do well in busy public settings, it would be best to leave him home during trick-or-treating. If you will be home handing out candy, be sure your dog is secured somewhere in your house away from your front door with your candy stash out of reach. We all know chocolate in certain quantities can be toxic for dogs, but so can many other types of candy (particularly anything that contains the ingredient Xylitol). Be sure to keep those after trick-or-treating stashes put away some place where your dog won’t find them. Your dog would do best with a safe, deliciously-stuffed puzzle toy or KONG in a crate or room where he can relax while you greet trick-or-treaters. For a super long lasting KONG toy, check out one of my favorite recipes here. Halloween is one of the top holidays where pets go missing. With doors opening and closing frequently and dressed up children on the other side, many dogs easily dart outdoors. The last thing you want to do on a dark Halloween night is have to search for your dog. If you will be handing out candy, even if your dog is secured in another location (like a crate or bedroom), it’s not a bad idea to make sure that they are wearing current I.D. tags just in case you have an escape artist (please do not ever leave a dog in a crate while wearing a collar if you are not going to be able to frequently check in on him). If your dog reacts to your doorbell or door knocking, setting him up with a food-stuffed toy will decrease barking and stress. If your dog is severely stressed by your doorbell, talk to your vet about anti-anxiety options that will help your dog get through the evening You could also alternatively hang a sign on your door asking trick-or-treaters to please not knock or ring your doorbell. Follow these tips and you’ll be sure to have a merry and scary fun Howl-o-ween! Happy Hauntings! For more great tips and training that works for your specific household, set up an in-home consultation with local dog trainer, Kat Stevens-Stanley. Kat welcomes dogs of all types, breeds, sizes, ages and even those who may be deemed “scary” or “spooky” to her private classes. Kat is best reached at (248)982-9539 or on the web at www.KatStevensDogTraining.com. You can also find her on Facebook at facebook.com/katstevensdogtraining.